Though hundreds of documents regarding the assassination of President John F. Kennedy remain a secret, the 2,800 newly released records offer a tantalizing window into the event that shook the world and the ensuing investigations that have never quite satisfied assassination researchers — and conspiracy theorists. 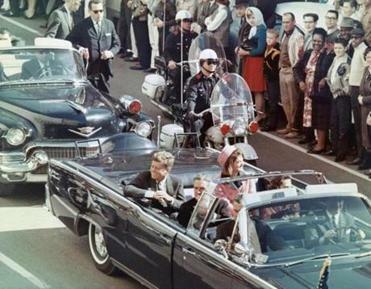 The records released Thursday do not solve the mystery surrounding the assassination. The official story of a lone, deranged Lee Harvey Oswald killing the president still stands. But the latest release has made some people even more anxious for the remaining files to be released. Philip Shenon, a former New York Times reporter who is the author of “A Cruel and Shocking Act: The Secret History of the Kennedy Assassination,” said he was disappointed. “The most secret material is still secret, and I’m not convinced the public will ever see a lot of it,” he said. Shenon said the new records would just fuel further conspiracy theories — and the records do offer tidbits — couched in reports written in imposing officialese — that would bolster a variety of wild theories. President Trump approved 2,800 records for release but had “no choice” other than holding others because of national security concerns, officials said. ■A cable less than a week after the Nov. 22, 1963 assassination, from the US embassy in Mexico City to Secretary of State Dean Rusk raised the specter of Oswald being both a deranged, disgruntled loner — and someone who had received a payment from the Cubans during a visit to Mexico two months before. Shenon said it appeared to be a cable from Ambassador Thomas C. Mann, who told assassination investigators years later that Rusk had ordered him to shut down any investigation in Mexico. “It certainly points to how much suspicion there was by some people in Mexico City, especially the ambassador, that there was a plot that had been hatched on Mexican soil,” said Shenon. “That would have been the most perfect pretext for the United States to invade our country which is what I have tried to prevent all these years, in every possible sense,” he said. The report dismissed the theory that US assassination attempts against Castro inspired him to retaliate. ■A day after Kennedy was killed, the CIA was looking into a meeting Oswald had during his Mexico City visit with a KGB officer. The CIA official who wrote the memo, titled “Contact of Lee OSWALD with a member of Soviet KGB Assassination Department,” said he was turning the information over to the FBI. “He certainly used to say that in the early days of his Presidency and where he got this idea from I don’t know. I don’t how many of you had the privilege of trying to argue with Presidents about things like that but you tend to be a loser,” Helms said. The investigator continued, “Is there any information involved with the assassination of President Kennedy which in any way shows that Lee Harvey Oswald was in some way a CIA agent or an agent ...” And there the document ends. ■A cablegram from 1964 revealed that the FBI investigated Oswald’s bus trip to Mexico. The document included specific seat numbers on a bus that he took and details about passengers in front and behind him. Twenty-two sources were interviewed about Oswald’s travel, along with other passengers on the bus, the document states. The British Security Service reported that similar anonymous calls of a “strangely coincidental nature” were made to people throughout the UK that year. ■ A memo from FBI Director J. Edgar Hoover two days after the assassination laid out the details of Jack Ruby’s murder of Oswald and the aftermath. In it, Hoover notes that Oswald’s death would be seen as a civil rights violation. “There is nothing further on the Oswald case except that he is dead,” he wrote. ■In a 1966 report sent to the White House, Hoover detailed the reactions in 1963 of Soviet and Communist Party officials to Kennedy’s assassination. Party officials “seemed convinced that the assassination was not the deed of one man, but that it arose out of a carefully planned campaign in which several people played a part,” the report said. Because of this suspicion, the KGB was looking into the “personal relationship” between Johnson and members of the Kennedy family, particularly Robert and Edward “Ted” Kennedy. ■ In a 1976 memo written for the House Select Committee on Assassinations, an investigator detailed his efforts to confirm the story of a man who said he saw Oswald and Jack Ruby, the man who would later kill him, at the Key West International Airport before the assassination. Gaeton Fonzi said he returned from Key West “more frustrated than tired” and unable to confirm the story. He said both Oswald and the handler had been “transferred to Dallas” at the same time. ■ Pena’s handler was Special Agent Warren DeBrueys. And the documents do show that DeBrueys was aware of Oswald. It wasn’t clear what the “separate investigation” was. ■An informant told the FBI in 1964 that one of the members of the Minute Men, a virulently anti-Communist group in the Fort Worth area, came to his house at night about six weeks prior to the assassination and asked for ammunition. “A man was with him. Both men stayed in the yard and did not enter the house. The informant got the ammunition and gave it to them,” according to an FBI report. Neither he nor his wife “thought any more about it,” the report said, until they saw Oswald’s photo in a newspaper. “Both noticed a close resemblance between Oswald and the man who was with the Minute Man a few weeks before,” the report said. “Both said they felt the Minute Men were involved in the assassination although they claimed that very little was said by members they know following the assassination except to express satisfaction that it happened,” the report said. Material from The New York Times, CNN, and the New York Daily News was included in this report. Jim O’Sullivan of the Globe Staff contributed. Felicia Gans can be reached at felicia.gans@globe.com. Follow her on Twitter @FeliciaGans.